Approximately eight million tons of litter from land-based sources end up in our oceans each year. More than two thirds of it consist of non-degradable synthetic polymers. This plastic debris has become a major threat to marine ecosystems. Even the remotest of beaches, far away from the nearest civilization, are accumulating vast amounts of plastic litter. From pole to pole, on land, in the rivers and oceans, within the water column as well as on the sea bed - remnants of plastic can be found everywhere. Often it consists of fishing equipment, plastic bags and packaging material. Yet the debris that is visible to us by floating at the sea surface is only a fraction – 70 % of plastic waste sinks to the sea floor. German seas and coastlines are also affected. A total of 600,000 m3 of litter are estimated in the North Sea alone. Major sources of litter are cities, industries, harbours and tourism. Ghost nets. 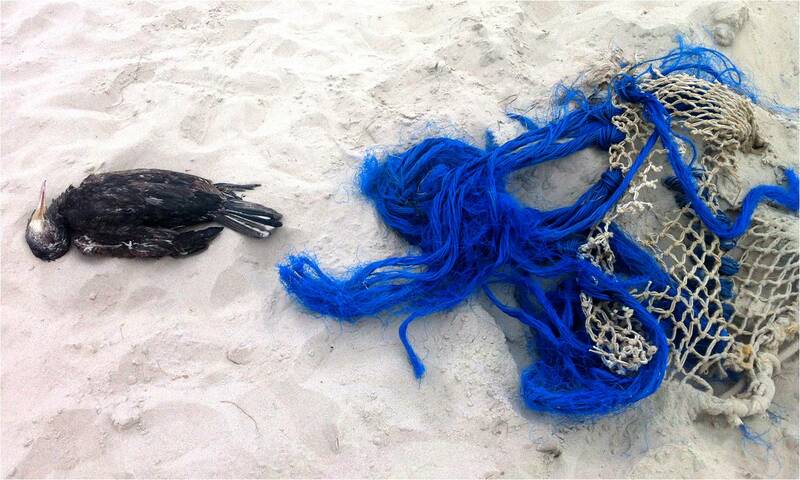 Many species get entangled and die in these discarded nets. The ecological impacts are particularly devastating. Marine and marine-related animals mistake plastic litter objects for their natural diet and consume them. Several hundred thousand individuals get entangled and die in discarded fishing nets, so-called ghost nets. An additional problem: Certain animal and algae species colonise marine litter and get transported as hitch-hikers across the oceans into regions where they may threaten endemic flora and fauna. In addition, aesthetic aspects need to be considered: Coastline beaches become polluted with litter. Technical facilities such as sluices and barrages are also affected, and so is the shipping industry. Plastic litter gets attached to ship propellers, causing blockage. Through the UV-radiation of sunlight and mechanical wave action, plastic at sea becomes brittle over time and eventually disintegrates into tiny fragments (microplastics, < 5 mm). These microscopic plastic particles cannot be biodegraded by microorganisms like organic matter can. Therefore, microplastics can make their way through the food chain into our own food. As soon as larger plastic fragments (macroplastics, > 5 mm) have disintegrated into small microplastics they can no longer be removed from the oceans. Plans to fish macroplastics out of the oceans still raise several questions. Studies need to test whether such approaches may not cause more harm than benefit. There is a real risk that organisms will be extracted together with the plastic, creating a lasting imbalance in the marine ecosystem. The primary goal is to not let plastics enter the oceans in the first place. Identifying potential polluters along the coastline and on the islands of the southern North Sea has to be improved. On the basis of current and future distribution patterns, solutions and abatement strategies will be developed. Various stakeholders with a direct link to the issue of plastic pollution will be involved and can actively partake in defining active steps and long-term goals. We need your help in identifying pathways of plastic into the North Sea as well as distribution patterns therein. How that works and what you can do? One part of our project is the release of so-called “drifters”. They are made of small pieces of wood onto which a short message has been branded with information regarding the project. These drifters will be released at selected locations along the North Sea coast and the major rivers Elbe, Weser and Ems. Everybody who finds such a drifter can report it directly to us. With these wooden drifters, we aim to simulate the “travel route” of plastic litter in the ocean, specifically the North Sea. Barnes, D. K. A. (2002): Biodiversity Invasions by marine life on plastic debris. In Nature 416 (6883), pp. 808–809. Browne, M. A.; Chapman, M. G.; Thompson, R. C.; Amaral Zettler, L. A.; Jambeck, J. et al. (2015): Spatial and Temporal Patterns of Stranded Intertidal Marine Debris: Is There a Picture of Global Change? In Environ. Sci. Technol. 49 (12), pp. 7082–7094. Clemens, T.; Bednarova, Z.; Hartwig, E. (2002): Zur Müllbelastung der Insel Minsener Oog (Außenjade) 1995 bis 2000. In Natur- und Umweltschutz (Zeitschrift Mellumrat) 1 (1), pp. 18–23. Derraik, J. G. B. (2002): The pollution of the marine environment by plastic debris: a review. In Marine Pollution Bulletin 44 (9), pp. 842–852. Eriksen, M.; Lebreton, L. C. M.; Carson, H. S.; Thiel, M.; Moore, C. J. et al. (2014): Plastic Pollution in the World's Oceans: More than 5 Trillion Plastic Pieces Weighing over 250,000 Tons Afloat at Sea. In PLoS ONE 9 (12), pp. e111913. Laist, D. W. (1987): Overview of the biological effects of lost and discarded plastic debris in the marine environment. In Marine Pollution Bulletin 18 (6), pp. 319–326. OSPAR (2010): Guideline for Monitoring Marine Litter on the Beaches in the OSPAR Maritime Area. Schulz, M.; Clemens, T.; Fleet, D.; Flegel, I.; Förster, H. et al. (2014): Zur Müllbelastung der Nordsee – eine statistische Analyse von Langzeituntersuchungen an Stränden der Deutschen Nordseeküste. In Der Mellumrat e.V. - Natur- und Umweltschutz 13 (2), pp. 55–59. van Franeker, J. A.; Blaize, C.; Danielsen, J.; Fairclough, K.; Gollan, J.; Guse, N. et al. (2011): Monitoring plastic ingestion by the northern fulmar Fulmarus glacialis in the North Sea. In Environmental Pollution 159 (10), pp. 2609–2615.